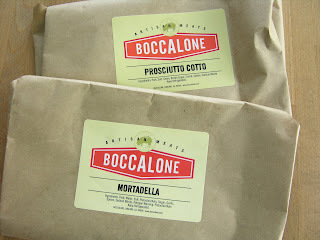 Speaking of the Ferry Building, there’s one more thing you really ought to know about, and that’s Boccalone, a salumeria whose motto is “tasty salted pig parts.” Now if their salumi selection didn’t get your attention, that motto certainly ought to. If you’re a fan of salumi in general, you may at first find yourself delightfully overwhelmed by their selection. Let me walk you through it so you don’t miss anything. They have a refrigerator case with various salamis wrapped in paper as well as an assortment of fresh sausages and other pre-packaged meat products. Their menu is divided into three sections: cooked meats, cured meats, and salami. Additionally, if you need your fix right then and there, you can sample their wares by getting a salumi cone that harbors an assortment – that should help if you’re having trouble deciding what to take home. They also make sandwiches and panini that are served all day. You can order your salumi in four ounce portions to be sliced on request; you may have to wait five minutes or so while they fix up your order. I think this seems like the perfect time to pick up some cheese at the Cowgirl Creamery. 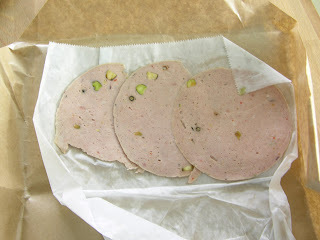 If there is one thing you absolutely need to try from Boccalone, it’s the mortadella. This is one of the (many) reasons I’m not a vegetarian. Whatever traumatic past experience you may have had with this often abused meat, this will heal you. Perhaps you’ve tried the disgusting pre-packaged, pressed mystery meat in the deli aisle of your favorite grocer. Perhaps you thought this was what mortadella was really supposed to be like and have spent every day trying to forget the taste and texture. Be healed. Prosciutto Cotto-I can best describe this as fancy ham, good on panini or a croque monsieur. Salumi vs. Salami: What in the heck is the difference? You may ask, aren’t salumi and salami the same thing? There’s been more than a little confusion over the difference between the two as salumi and charcuterie started showing up on more restaurant menus. (Read the amusing SF Chronicle article.) And the answer is no, no they are not the same. Salumi is an Italian word referring to cured meats, actually making salami a type of salumi. Salami is basically cured sausage that is fermented and then dried. Now you know. Wow I never knew there was a difference between Salumi and Salami! I always thought it was just a different way of spelling! Thanks!